and responsibility of every single person in our society"
Affirmative action is practiced in many areas of our society in addition to leveling the playing field for people of color. There are hiring and recruiting preferences for veterans, women, the children of alumni of many universities. There are special economic incentives for purchase of U.S.-made products, import quotas against foreign goods, and agricultural and textile subsidies. Over many decades these practices have led to a huge over-representation of white people, men and people of middle, upper middle and upper class backgrounds in our universities, in well-paid jobs, and in the professions. One indication that attacks on affirmative action are part of a white backlash against equality is that affirmative action in the form of preferences that primarily benefit white people are not being questioned. There is pervasive racism in all areas of U.S. society. For example, in 1991 Diane Sawyer with ABC- TV filmed two men, one African American and one white, who were matched for age, appearance, education, and other qualities. They were followed for a day by a camera crew. The white man received service in stores while the African American was ignored, or in some cases, watched closely. The white man was offered a lower price and better financing at a car dealership. There were jobs where the African American was turned down, and apartments for rent after the African American man was told they were no longer available. A police car passed the white man while he was walking down the street but it slowed down and took note of the African American. (1) Hundreds of studies demonstrate discrimination against people of color in different areas of everyday life. Racism, rather than being self-correcting, is self perpetuating. The disadvantages to people of color and the benefits to white people are passed on to each succeeding generation unless remedial action is taken. The disadvantages to people of color coalesce into institutional practices which, although they may be race neutral in intent, adversely affect people of color. It has proven necessary to take positive steps to eliminate and compensate for these institutional effects of racism, even when there is no discernible discriminatory intent. Another area affirmative action addresses is preferential hiring programs. Many times people of color have been excluded from hiring pools, overtly discriminated against, unfairly eliminated because of inappropriate qualification standards, or have been rendered unqualified because of discrimination in education and housing. Court decisions on affirmative action have rendered illegal those qualifications that are not relevant to one's ability to do the job. They have also mandated hiring goals so that those employed begin to reflect the racial mix of the general population from which workers are drawn. There is no legal requirement to ever hire an unqualified person. There is a mandate that in choosing between qualified candidates, the hiring preference should be for a person of color when past discrimination has resulted in white people receiving preferential treatment. Middle class people of color have also benefited from affirmative action. All people of color have experienced the effects of racial discrimination. Having more money may buffer the most extreme effects, but it doesn't protect people from everyday racial discrimination. The middle class in various communities of color is small and often fragile. Its members own less wealth and have less financial security than their white counterparts because of the past effects of racial discrimination. They also experience the full range of cultural racism and white prejudice that all people of color have to deal with. Another argument raised against affirmative action is that individual white people, often white males, have to pay for past discrimination and may not get the jobs they deserve. It is true that specific white people may not get specific job opportunities because of affirmative action policies and may suffer as a result. This lack of opportunity is unfortunate; the structural factors which produce a lack of decent jobs needs to be addressed. It must not be forgotten that millions of specific people of color have also lost specific job opportunities as a result of racial discrimination. To be concerned only with the white applicants who don't get the job, and not with the people of color who don't, is showing racial preference. But how true is it that white male candidates are being discriminated against or are losing out because of affirmative action programs? If one looks at the composition of various professions such as law, medicine, architecture, academics and journalism, or at corporate management, or at higher-level government positions, or if one looks overall at the average income levels of white men one immediately notices that people of color are still significantly underrepresented and underpaid in every category. People of color don't make up the proportions of these jobs even remotely equal to their percentage of the population. They don't earn wages comparable to white men. White men are tremendously overrepresented in almost any category of work that is highly rewarded except for professional athletics. According to a 1995 government report, white males make up only 29 percent of the workforce, but they hold 95 percent of senior management positions. (3 ) Until there is both equal opportunity and fair distribution of education, training and advancement to all Americans, affirmative action for people of color will be necessary to counter the hundreds of years of affirmative action that has been directed at white males. It cannot reasonably be argued that white males are discriminated against as a group if they are overrepresented in most high status categories. Two other aspects of this dynamic should be noted. Although all white people benefit from racism, white men receive more of the economic and other benefits of racism than white women of the same socio-economic status. White men have always been favored in families and schools and preferred for jobs, training, educational programs, athletic programs, military careers and job advancement and promotion. Men still make more than women for comparable work, are given better educational opportunities, have more leisure time and are accorded higher status than women. Business leaders are able to exploit male workers by appealing to common bonds and common fears among white men. They have played on white male fears of losing their jobs (and their manliness) to keep them working hard, claiming that only white men had the strength, skill, intelligence, independence, strength of character and virility to do the job. White workers have often bought these arguments feeling pride and increased self-esteem in their working abilities, and feeling personally threatened by the presence of people of color and white women in the workplace. Their ability to fight against low wages, unsafe working conditions, the restructuring of their jobs and plant closures has been diminished even while they thought they were protecting their jobs through race riots, anti-immigration laws, attacks on affirmative action and workplace discrimination, harassment and exclusion. Affirmative action helps mitigate the historical effects of institutional racism. It also counters the effects of current discrimination, intentional or not. Not all white people are well intentioned. Some believe that everyone should have an equal chance but still hold deep seated prejudices against people of color. For a substantial number of whites, however well-intentioned, those prejudices lead to discrimination. Without specific, numerical goals, it has been found that many people and organizations continue to practice discrimination while professing agreement with equal opportunity. There are so many subtle and not-so-subtle ways to eliminate people of color from the job application process it is not surprising that employers have found ways around affirmative action unless it is tied to visible hiring and promotion targets. In a society with such overwhelming evidence of racism, it must be assumed that individuals and organizations will resist efforts to end it. For instance, in 1993 the Equal Employment Opportunity Commission had a backlog of 70,000 discrimination cases. (6 ) It is necessary to set goals and enforce and monitor standards because this is the only way compliance can be measured. These are the mechanisms needed to ensure that affirmative action is more than a facade. Some people have claimed that affirmative action programs lower self-esteem in those who are favored by them, perhaps even in those individuals who do not directly benefit from them. There is no systematic evidence for this effect. It seems to be something that white people worry about more than people of color. Persistent denial of equal opportunity and therefore inadequate access to good jobs, good education and housing leads to poor self-esteem. It is discrimination that seems to be the more important harm to eliminate. People who are truly worried about low self-esteem among people of color should be strong advocates for effective affirmative action programs to counter discrimination. Affirmative action has been a symbol of white people's acknowledgment of and serious commitment to eradicating racial discrimination. It has been interpreted as such by most people of color. It is crucial that at this stage of backlash against the gains of the last three decades, we do not abandon programs that counter the effects of discrimination. When whites attack affirmative action if they are truly committed to American ideals of justice and equality they should be proposing other remedies for racial inequality in our society. The hypocrisy is clear when white people who say they support equal opportunity attack affirmative action, yet want to leave intact the basic economic and racial injustices it is designed to correct. 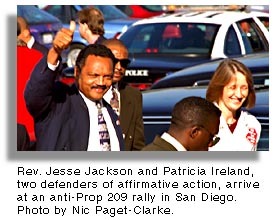 Ask people who oppose affirmative action how they propose to eliminate racial discrimination. You can learn a lot about their true beliefs from their answers. 1. Horne, Gerald. Reversing Discrimination: The Case for Affirmative Action. New York: lnternational Publishers. 1992. pps. 40 41. 2. Ezorsky, Gertrude. Racism * Justice: The Case for Affirmative Action. Ithaca, NY: Cornell University Press, . 1991. p. 64. 3. Sklar, Holly. Chaos or Community? : Seeking Solutions, Not Scapegoats for Bad Economics. Boston: South End Press. 1995. p. 115 . 4. Sklar, op. cit. p. 9. 5. Manliness is defined differently, but no less exclusively, in the computer industry than in trucking or construction. 6. chideya, farai. Don't Believe the Hype: fighting cultural misinformation about african-americans. New York: Plume/Penguin Books. 1995. p. 110. Adapted from Uprooting Racism: How White People Can Work for Racial Justice by Paul Kivel, ©1996. Used with permission. To order, send $16.95 plus $3.50 shipping to New Society Publishers, 4527 Springfield Avenue, Philadelphia, PA 19143, or call (800) 333-9093. To arrange a workshop, call Paul Kivel at (510) 654-3015. Published in In Motion Magazine November 17, 1997.